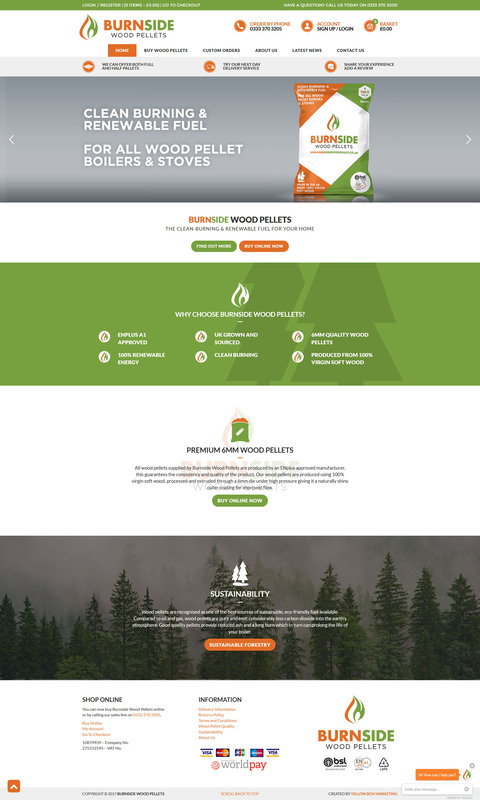 Burnside Wood Pellets are an online retailer supplying wooden pellets for business and domestic wood pellet burners. Wood pellets are recognised as one of the best sources of sustainable, eco-friendly fuel available. Compared to oil and gas, wood pellets are pure and emit considerably less carbon dioxide into the earth’s atmosphere. Good quality pellets provide reduced ash and a long burn which in turn can prolong the life of your boiler. Burnside required a mobile-friendly e-commerce website that would allow customers to quickly and easily purchase pallets of their product for delivery throughout the UK. We also worked closely with the company to develop a brand identity and product packaging that demonstrated the quality and values of their product.